Usually, mostly, and as a general rule, your computer starts up and runs well. You turn it on, enter your password if required, and proceed to have a, (hopefully), happy day on the other side of Alice's mirror in Computer Land. Sometimes things don't work out so nicely. You turn the computer on and things go awry in weird and bizarre ways. Or there's that sickening, sinking feeling you get in the pit of your stomach when your computer starts up with a "no boot device available" message, or sits there - black-screened - with a little white underline cursor blinking at you in the upper left hand corner, as if to say "Ha! Ha! Ha! You're thoroughly hosed now!!" Since you are reading this, your computer is, (hopefully), not borked beyond all recognition and we can begin with a machine that is still in running order. There are certain things that can be done right now, without specialized tools, that can mean the difference between disaster and a successfully recovered system. This is a life-saving trick that really doesn't get the exposure it should. Seriously! I have done things that can only be classified as "abysmally stupid" in hindsight; and had my computer - though still bootable - in very deep sneakers, with no idea whatsoever as to how to dig myself out. If it weren't for the System Restore feature - I'd still be in deep sneakers with no way out but a complete bare-metal re-install. 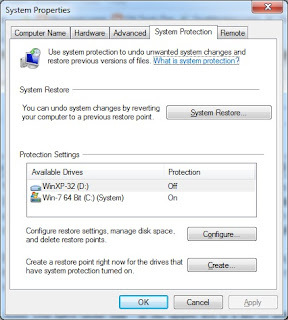 What System Restore does is to save periodic snapshots of your system's critical configuration data, (called "restore points"), which are snapshots of system files, registry entries, driver status, etc. If, and when, your system gets corrupted by an install that went awry - or some other reason, (wink! wink!) - you can use System Restore to, in essence, return your computer to an earlier point-in-time when things were not damaged. System Restore needs to be enabled and running. I know, this is one of those "Ya Think?!" statements - but seriously, System Restore is often not running - or has been disabled for some reason - and the status of the System Restore service needs to be checked periodically. Note: You will find articles on the Internet advising you to turn System Restore off for one reason or another. They allege it will speed up your system, (false), or that you will recover tons of disk space, (only partially true), or that it's undesirable for this or that reason, (absolute B.S.). They actually have the gall to suggest that you should destroy your first line of defense against system destruction to gain some nebulous - and often minimal - improvement to your system. Which, In My Humble Opinion, is absolute insanity! Now I will admit, System Restore does reserve a chunk of your hard drive for system restore points. Of course, Windows also reserves chunks of your hard drive's space for the system swap-file, the hibernation file, crash-dump files, Windows Update backups and so on. If you are getting so tight on disk space that you are considering dumping your system's restore points - you really need to go buy a huge external drive to put stuff on. It is my humble opinion that - if you need to dump something - dump all that worthless advice instead of System Restore. Open your START menu by clicking on the "Windows" icon in the lower left corner of your desktop - assuming you haven't moved the bottom task bar. Point to the "Computer" menu item on the right had side of the start menu and right click. A drop-down menu will open and you should click on "Properties" down at the very bottom. When you do that a Control Panel window opens up with important information about your system, its setup, and the operating system running. You should remember how to get to this point as you will very likely need this information in the future. What you should take note of now is in the center of the screen under "System Information". The "System Type" entry will say something about either a "32 bit" or "64 bit" operating system. Write it down somewhere and remember it. A sticky-label on the bottom of your computer is a good place to keep it. Even though this has nothing to do with System Restore, it is essential information to have, and since you're there anyway, you should take note of it and record it somewhere. After you have done that - in the upper left is a list of items one of which is "System Protection". Click on it. Notice in this case System Restore for drive "C:" is turned on. The "D:" drive is managed by a different operating system - with its own System Restore - so I have that turned off. You should see your C: drive with System Restore turned on. Click on the C: drive's entry so that it turns blue and follow the steps below. Click on the System Restore button. What should open up is a window that discusses System Restore. If you click next you should see a list of restore points that you can use. This means you're all set and ready to roll back the clock if necessary. Click "Cancel" three times to exit system restore and the system properties page and then close the Control Panel window. If, when you click on the System Restore button, you get a message saying that there are no restore points available, you should create one RIGHT NOW. And I'm going to show you how to do it. What has happened is either you just turned System Restore on, or (more likely), something has destroyed any previous restore points. To create a system restore point, exit the status window and return to the system properties page. There you will see a button that says "Create". Click on this button and a small window will open asking you to type in a description of this restore point. Type in some descriptive text - "Restore Point created after something clobbered them" - or something similar and then click on the button marked "Create". A dialog will open saying that a restore point is being created; and once that finishes you will see another dialog saying that it was created successfully. Exit the dialog and then try the test mentioned above under "If it is turned ON". You should see a list of restore points, with only one in it - the one you just created. Click "Cancel" several times to exit back to the control panel window, and then close it. In both cases, you are now set for rolling back your computer if disaster strikes. With System Restore turned on and working, Windows will - periodically - create "Automatic Restore Points" to create a trail of bread-crumbs you can use when disaster strikes. There is a rare, but real, possibility that when you go to the System Restore property sheet, select the drive that is "ON" and check for restore points by clicking on the "System Restore" button - a dialog will pop up telling you that System Restore is not enabled on this drive - leaving you scratching your head in wonder. You check if it is really on or not by verifying that the correct drive is selected and clicking on "Configure". When you get to the configuration page, it may even show that protection is turned on because the little dot is in the circle next to "Restore system settings and previous versions of files". What has happened is that the state of the System Restore service and the indications in the System Protection dialogs, have gotten out of sync somehow. This is rare, but it does sometimes happen. In this case System Restore is actually and truly off - it only thinks it's on. Here is how you re-sync it: Click on the "Disable" circle to put the dot there, and then click it back on the top circle again. Verify that the slider below shows some percentage of the disk reserved for restore points, (5% is a good starting value), and then click the "Apply" button which should now be lit. Hit "OK" to close that window and return to the System Protection property sheet and create a new restore point by clicking the "Create" button and following the steps given. First thing we need to do is turn System Restore on. To do that, you go to the System Protection property sheet by following the steps outlined above - but instead of checking System Restore, we're going to turn it on. To do that, first look at the hard drive or drives listed in the System Restore window. One of them should be your C: drive and we want to protect that. Click on the C: drive entry in the window and notice that it turns blue. Then click on configure. When you open the configuration page, it should show "Do not protect this disk" selected and we want to set that to the top item: "Restore system settings and previous versions of files" by pointing to the circle next to it and clicking on it. Further down, you will see a slider that determines how much of the hard disk should be reserved for system restore points. Mine is set to 5%, and that should be enough, and more, to hold enough restore points to get you out of trouble. 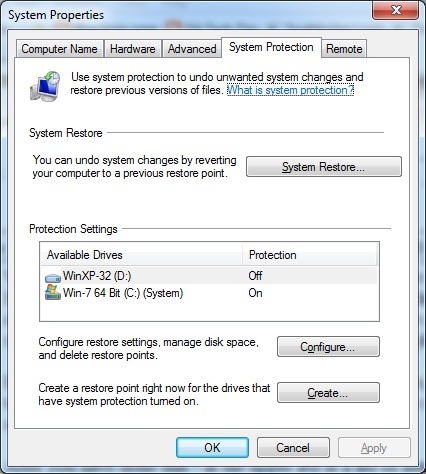 Click "Apply" and then "OK" to activate System Restore and return to the System Protection property sheet. When you return to the System Protection property sheet, you should see that your C: drive is set to "ON". Now that its turned on, go ahead and create your first restore point by clicking on "Create". You give the restore point a descriptive name, and actually create it by clicking on the "Create" button. At this point you should have System Restore turned on and at least one good restore point set. Now that System Restore has "got your back" so to speak, it will continue to create restore points periodically - especially when new software is installed. You've now taken your first step toward avoiding - and correcting if it should happen - system disasters.